Rogue Flat Utility Bench 2.0 is rated 4.9 out of 5 by 85. Rated 5 out of 5 by RickLV from Good bench made better I like that the foam is firm, all the way to the edge. One minor issue is that the bench seat is supported by two 1/4" tall support brackets at either end of the seat, with no support bracket in the middle. This means that whenever you sit in the middle of the bench, the seat bows 1/4" down until it hits the frame. Not a very secure feeling. I tried several fixes and the best fix that I discovered is to attach a piece of plastic that is 0.25" thick x 2.5" wide x 12" long to the middle of the frame under that seat. I used a piece of polypropylene that I bought from Amazon, cut it down to size, sanded it for better adhesion, and attached it with clear silicone. Now the bench feels rock solid! Rated 4 out of 5 by DBulay from Great bench / a little high Fantastic bench and incredibly well put together. I love the fact that it came fully assembled and made it very easy to get right to work! Only complaint would be that as a competitive Powerlifter, the bench is slightly higher than standards of competition & most benches I've used at any commercial gym as well. So it was a little awkward keeping my feet flat while benching. Otherwise, bench is a fine piece of equipment. 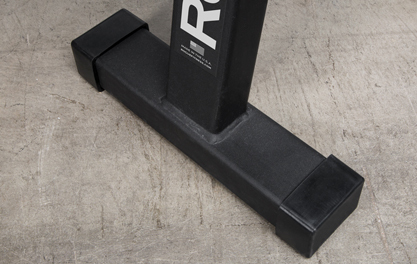 It's only about half an inch higher than the west side 2.0 & adjustable 2.0 rogue benches, and it's a little awkward for me, however I simply throw rubber matts under my feet for some lift. Rated 5 out of 5 by Vincent from What I needed; really solid and stable Could have bought a 99$ bench off any online retailer that ships to Canada, but since I'll probably own and use this bench until I die, I decided that I'd buy (yet again) from Rogue. 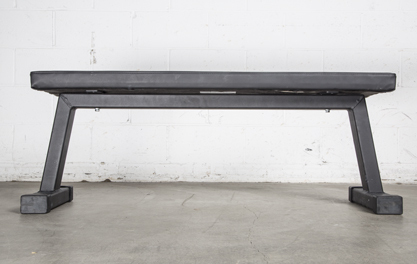 It is expensive when you consider shipping costs to Canada (heck, I can buy a cheap bench for the shipping costs alone of this Rogue product), but what you get is a perfectly assembled, sturdy, strong, reassuring, exciting and, yes, beautiful looking bench. No assembly required: put the rubber feet on it and bench-press away. My gf uses it for box jump practice, and we have plans for many other types of workouts on it. 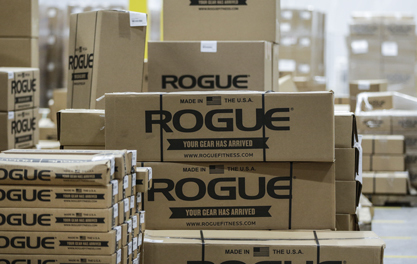 Great Rogue product, as usual. Rated 5 out of 5 by Yoyodyne from Superb quality and value! I'm not doing heavy lifting so I thought I could make do with a cheaper bench. Wrong! The quality of the bargain-priced ones I saw was horrible, so I started looking at higher-quality benches and the Rogue immediately caught my eye. All-welded construction, a pad that isn't made of marshmallows, built in the USA...and the price was still reasonable. I ordered it with high expectations, and was not disappointed when it arrived. It's built like a tank, stable as a rock and beautifully finished too. One of my all-time favorite purchases! Rated 5 out of 5 by Zone from Light and Rugged Bought this for my commercial Gym. Exactly what I expected from Rogue. High quality, and very comfortable placing it in a commercial facility. Lightweight for easy maneuvering, and very stable. Everyone loves the grip of the pad. As an owner, I would have liked to have had a surround guard option for the bottom edges of the pad. As I have seen too many ripped up by users doing dumbbell rows. Other than that, cannot not wait for my next Rogue purchase ! Rated 5 out of 5 by HarleyMan from Perfect Bench Great bench, very well built and over built. You get what you pay for. When OOPS I mean UPS delivered the bench it was in what looked to once resemble a box. I was thinking when I saw the “box” it had to be damaged there’s no way it couldn’t be. But it’s built like a tank, didn’t have a scratch on it. My only complaint is whoever Rogue has slapping these stickers on must be cross eyed. Either put it on straightish or let the customer put the sticker on. Rated 5 out of 5 by RobertG from Must Have If you are serious about getting stronger, this is a must have. I had a Marcy Club bench from Big 5 before this and it broke while I was benching. It can be a very dangerous situation if you are loading too much weight on a cheap bench that can't support it.